It's Saturday, so naturally we were out a-sale-ing. It's also a holiday weekend with not a whole lot going on, so...slim pickings. 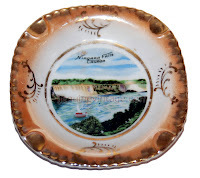 But one of the things we did find was a little Niagara Falls souvenir ashtray . Okay, but not great. But there are plenty of NF collectors around. Tourists have been gawking at the Falls since forever; and dealers have been hawking the Falls for just as long. When PZ and I got married in 1969 we couldn't make it to Woodstock, so naturally we did the next best thing: we waited 'til the middle of November and went to Niagara Falls. It was beautiful; the ho'frost was all frozen in the trees looking very winter wonderland and all, and oh yeah, the Falls was shut off. Did I mention that? I know you saw that 1950s film about the kid who accidentally shuts off the Falls, (SPOILER: IT WAS A DREAM!) but this is the emmis. To retard erosion, the US Corps of Engineers stopped the flow over American Falls for a little behind the scenes work and they remained dry until November 25, 1969. Anyway, this ashtray is pretty early, late 19th century, I'm thinkin'. If we look closely we can see that the image is transferware: this is a process out of mid 19th century England. A copper plate is engraved with the scene then used to print said scene on a piece of tissue which transfers the wet ink to your piece of china. Pop 'er into the kiln and you're done. Okay so now we know it's no earlier than mid 19th century. Next we look at the illustration again and in the corner, I spy with my little eye, a little boat. And, Indiana Jones like, I make a leap of faith and guess that it's the Maid of the Mist which has, in all its various incarnations, been getting tourists all wet down there since as early as 1846, but due to money troubles and the War of Northern Aggression, really did not get going until around 1893. And that's when tourism is really getting off the ground, and into the water, so to speak. What a coincidence. Next, flip the thing over. A whole lot of nothing; at least no trade or maker's marks or country of origin. Why is this important? Because in 1890-'91 the McKinley Tariff Act required goods coming into the US to be marked with their country of origin. Okay but what if it was made in USA? would it still need a mark? Nope. We know, maybe, it's pre 1891. Maybe not. But probably somewhere in the 1890s. Maybe. That's a whole lotta maybe's. Nothin' for sure, just a lot of educated guessing. And that's the process, kids, that's how we do it. Do not look behind the screen. Oh, as for today's blog title, there was once an old vaudeville routine which involved the trigger phrase "NIAGARA FALLS."